All transactions are safe and secure with a reliable history in online purchasing behind each of our associates. Buy the Always Bet on the Little Guy t-shirt to own Boardwalk Empire clothing and merchandise. Nothing like a day at the midget boxing ring, at least that's how a young Al Capone feels. You might recall Nucky's driver, Jimmy Darmody, talked with him at the match and gave Capone the advice to bet on the little guy. 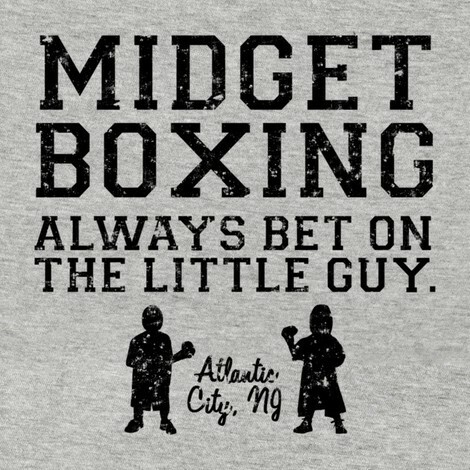 This Midget Boxing t-shirt features that amusing approach. If it gave you a chuckle then get yours today. If not, keep perusing our other Boardwalk Empire tees like the Four Deuces shirt. In addition to the Always Bet on the Little Guy tee above, browse the Boardwalk Empire Clothing Gallery for more apparel like men's and women's clothes, kids shirts or hoodies.